Traded from his hometown San Francisco Seals to the Detroit Tigers in November of 1920, pitcher Bob Cole had attracted the attention of a figure no less than Ty Cobb beforehand, with the Georgia Peach watching the southpaw pitch in an October contest that year, praising his “size and action”, and noting how he liked the way Cole changed-up his pitches. Five seasons would be spent in the Motor City, with his most noted achievement being the June 13th 1924 melee started with Yankees fielder Bob Meusel, when after a bleacher-clearing brawl, the two players were handed 10-day suspensions by Ban Johnson. Originally sold in 2007 for just north of $45,000 (along with additional items no longer with the jersey), we have a Tigers jersey worn by the Californian circa-1922, with parts of this specimen removed and donated to restore an especially important period Detroit Tigers jersey. A Spalding label remains affixed to the collar, with a second faded label placed directly beneath. Sporting its original black piping, the heavy grey flannel feature’s original intact mother-of-pearl buttons, with the black felt old English “D” over the left breast a modern replacement. “Cole” in script has been chain-stitched in black threading over the reverse right tail, with both sleeves custom-shortened – typical for pitchers of the era – with approx 6” also cut away from the front section of the jersey along the base, with an additional roughly 6” x 7” section removed from the reverse left tail. 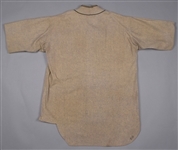 We needn’t mention that any uniforms bordering the highly coveted Dead Ball era are exceedingly scarce, especially pleasing, displayable flannels with wonderful period aesthetics. 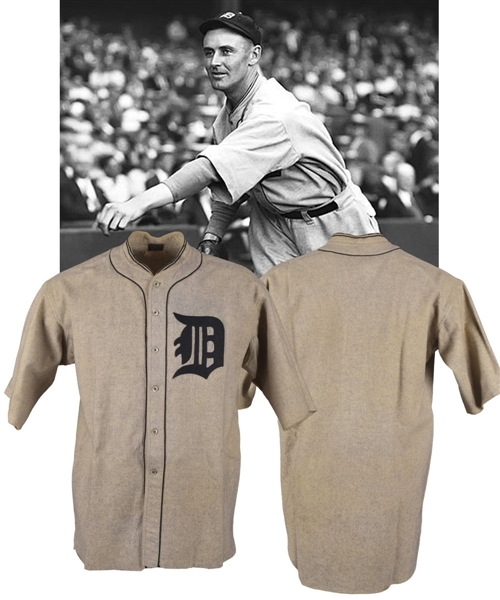 An LOA from Classic Auctions will accompany this important Detroit Tigers specimen. Sporting a clean front with no obtrusive wear or marks, there is some minor fraying to the black piping encircling the collar, with a few areas of mild discolouration, including over the inner collar.